On Nov. 8, the Vikings activated Teddy Bridgewater and put Sam Bradford on injured reserve. But something else of note was mentioned by coach Mike Zimmer. If you are looking for a defining date in this whole confusing and wonderfully speculative Vikings QB situation, try this one: Nov. 8, 2017. Here in late February, any Vikings comments about Case Keenum, Teddy Bridgewater, Sam Bradford or Kirk Cousins are either held tightly like state secrets or — in the case of Cousins — would amount to tampering before NFL free agency begins March 14. GM Rick Spielman did the delicate tap dance at the scouting combine Tuesday, saying a lot but not really saying anything (which is his specialty, and I mean that as a compliment). But go back to Nov. 8, and you will find an eight-minute video clip of Vikings head coach Mike Zimmer talking about all four quarterbacks as frankly as he can (though again, without divulging too many secrets). On that date, the Vikings made it official that they were activating Bridgewater and putting Bradford on injured reserve. There was all sorts of speculation that Bridgewater would supplant Keenum as the starter at some point, but all we knew on Nov. 8 was that Keenum would start and Bridgewater would be the backup for the first Vikings game coming out of the bye — at Washington, quarterbacked by Cousins. Zimmer met with the media on Nov. 8, a Wednesday, and was peppered with quarterback questions. Indeed, the Pro Football Focus stats back that up. Last season, Cousins had a 118.7 passer rating when using play action — second-best in the NFL. Keenum ended up throwing for 304 yards and four touchdowns in a 38-30 win over Washington, but he also threw two costly interceptions that almost helped Cousins — who was 26 of 45 for 327 yards, one TD and one INT — bring the Redskins all the way back. But Bridgewater was the backup that Sunday and ultimately only appeared briefly in mop-up duty in one game late in the season. Bradford was activated for the playoffs ahead of Bridgewater — a sign his knee was at least healthy enough at that point to compete — but he never played. 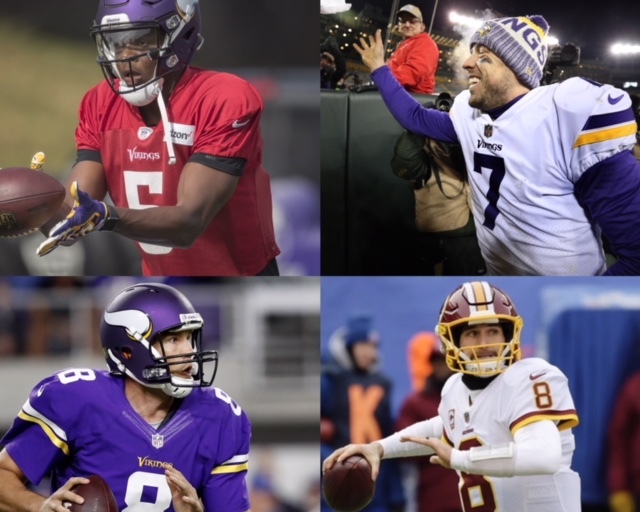 On Nov. 8, it was anyone’s guess as to who would be the Vikings’ QB in 2018. The smart money was probably on Bridgewater, with Bradford a possibility and Keenum a longer shot. Now it’s still anyone’s guess, with Keenum and Bridgewater the most likely of the in-house candidates even in light of this week’s reports that the Vikings don’t plan on using the franchise tag on Keenum and that Bridgewater will in fact be a free agent. But the smartest money just might be on Cousins — the only quarterback Zimmer talked about that day who wasn’t currently on the team.